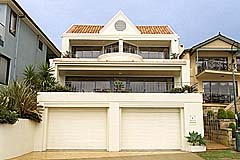 Exquisitely appointed north facing residence with panoramic ocean views nestled in a secluded cul-de-sac, on the cliff tops of Lurline Bay. 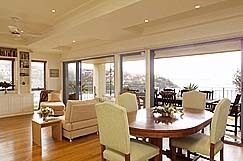 Standing in the open plan, free flowing living/dining room on entry to this exquisitely appointed north-east facing home, one glances out at the pictured Pacific Ocean view. This dramatic view is also afforded from a full-length balcony complete with a built-in BBQ. Modern, spacious kitchen in stunning pale lime polyurethane, grey marble with Gaggenau stainless steel appliances & ducted vacuum. This level also boasts a full bathroom, a generous sized laundry & large study/bedroom. Features 5 double bedrooms with built-ins & another full-length balcony capturing the awe-inspiring seascape, as well as a huge, sparkling bathroom with a decadent corner spa facing the ocean. 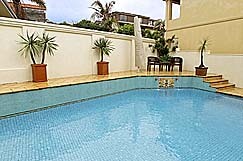 The 4th has its own ensuite & balcony overlooking the Mediterranean inspired heated, fully tiled pool. A 4-car garage & a back-to-base alarm complete the picture. In a secluded cul-de-sac, this is an opportunity rarely afforded to lease a property with such dramatic north-east facing coastal vistas. Note: Variances can be agreed on but only by arrangement with the owner in writing.Please ensure you read these as they affect your bond. Also, Please tell us if you are having friends over for a BBQ or party. Any damaged caused to the property will be paid for from the bond. Balance of the rental amount must be received in full 1 month prior to occupancy. If not the owner has the right to cancel the booking and attempt to re let it. Bond is payable at the same time as the balance amount. The bond will be refunded within 7 days in full subject to the terms and conditions being honoured. Additionally it is designed to cover any additional costs incurred including, but not limited to, any breakage, damage or excess cleaning requirements, extra guests beyond those declared etc. Cancellation if caused by the client. A refund of any money beyond the non refundable 50% deposit will be paid if the house is re-let for the entire period. To maintain a good standard for our guests we require certain conditions to be complied with. We appreciate most will respect our beach house but the occasional abuse requires we state the following conditions. Departure - The place should be left in a similar condition to how you found it. Check out is by 12 NOON. Furniture - Must not be moved from one room to the other. Linen - Bed linen is provided and beds are made up for you. You will need to bring beach towels. Damage, Breakages, Theft and Loss is the tenant's responsibility during their stay. Guest Numbers must not exceed the advertised maximum of 10. Noise - The house does not contain noise very well. Please be considerate to our neighbours who live next door - particularly at night. Unfortunately due to previous abuse it is a bond requirement. Parties and Functions are strictly prohibited. The price charged is for domestic use only and not commercial. Accordingly does not allow for the extra wear and tear from the expanded numbers of people or visitors associated with functions in terms of cleaning, garbage removal, wear and tear, repairs etc. Use contrary to this may result in total loss of your bond. Theft - The owners take no responsibility for the tenant's personal property. Vehicles must be no more than 4 in number on the property. 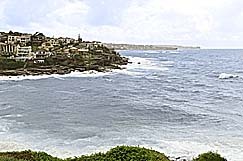 Tip for GPS users: Lurline Bay is a very small suburb between South Coogee and Maroubra. If you are using a GPS to find the property - please enter the suburb as Maroubra. Tip to upset the neighbours: Refer to the suburb as Maroubra instead of Lurline Bay. "Thanks Ana and Adam - We loved the big heated pool and breathtaking views. We did the Coogee to Bondi walk. We will definitely be back next summer!" "We had a marvellous time. Lovely beach walks and nearby restaurants. All the mod cons in-house made for a relaxing and enjoyable week away."